These brief passages are as revealing as they could be: they show us a place of the utmost austerity in landscape which has changed very little from the days of the early Celtic Church; they give us a sharp vignette of Hawker himself and obliquely suggest the devotion of his whole life, which was that very Church. And the reader may surmise from these few lines how intimate was Hawker’s relationship to his wild parish which he served so faithfully for forty years. I have known something about Hawker for a long time, though he has dropped out of fame during our century so completely that I am aware of only one article written about him for nearly fifty years, one by Mr. John Betjeman, in a periodical several years ago. But though I had always been interested in him, I had never seen Morwenstowe before last autumn when I travelled there over Bodmin Moor from St. Austell’s. It was a journey of about fifty miles but for nearly the whole way the landscape hardly changed at all. It was incredible that so bleak and elemental a scene, so gaunt and bare that every tempest had free play and the only conspicuous points for the eye to rest on were the squat and rock-piled heights of Brown Willy and Rough Tor, had been thickly inhabited by prehistoric man. It brought home to me King Lear’s lines about “unaccommodated man”. As usually happens when two geological formations meet, here the granite and the mountain limestone, the country modified its sternness as it approached both the sea and the Devon border; it became more undulating and wooded glens slightly broke its uniformity. But as soon as I turned off the road that leads to Barnstaple and Bideford, the moors, criss-crossed by turfed dry-walls, resumed their severity of outline and, once the hamlet of Morwenstowe (as in all Celtic settlements broken up into widely separated groups of cottages) was passed, the country again became almost as lonely as the Atlantic. A mile and a half from the roadside cottages there came into sight a block of rugged farm-buildings, a lych-gate, a churchyard falling steeply down the cleft of a skimpily-wooded cleft or coombe and on a terrace of the deepening glen the four-pinnacled church tower looking between the breasts of the bare downland on either side directly seaward. Less than a quarter of a mile further on, the downs ended in precipitous cliffs with only a small cove between them and the ocean stretching to the coast of Labrador. The hulk of Lundy lay a little to the north and the South Wales coastline was like a bank of low cloud to the north-west. This was the “breadth of wild and rocky land” of which this strange man was in more than one sense the minister. The very land itself had an oceanic quality about it in its huge swells and unfeatured plateau. The only relief from the barren simplicity of both were the fantastic precipices of carboniferous cliff, the distorted schists and sandstones of headland, black tower, buttress, needle and turfy ledge of a savage splendour that rivalled the decorative excesses of French Flamboyant Gothic. I was on the top edge of archaic Dumnonia and no place in England could be more remote from the levelling powers of modern civilization. Nothing could be more impressive than the way the Perpendicular tower of the church rises above and out of the glen to face that unbridled sea and spread its calm assurance over that land of Esau. It appears suddenly in the grim landscape like the mast of a ship in mid-ocean or a grove of palms in the desert and in its vertical poise unites the two worlds of land and water. It has an air of authority, or serene mastery that are deeply moving and, however well-sited other church towers may be in the West Country, none has quite the majestic power of Morwenstowe’s. 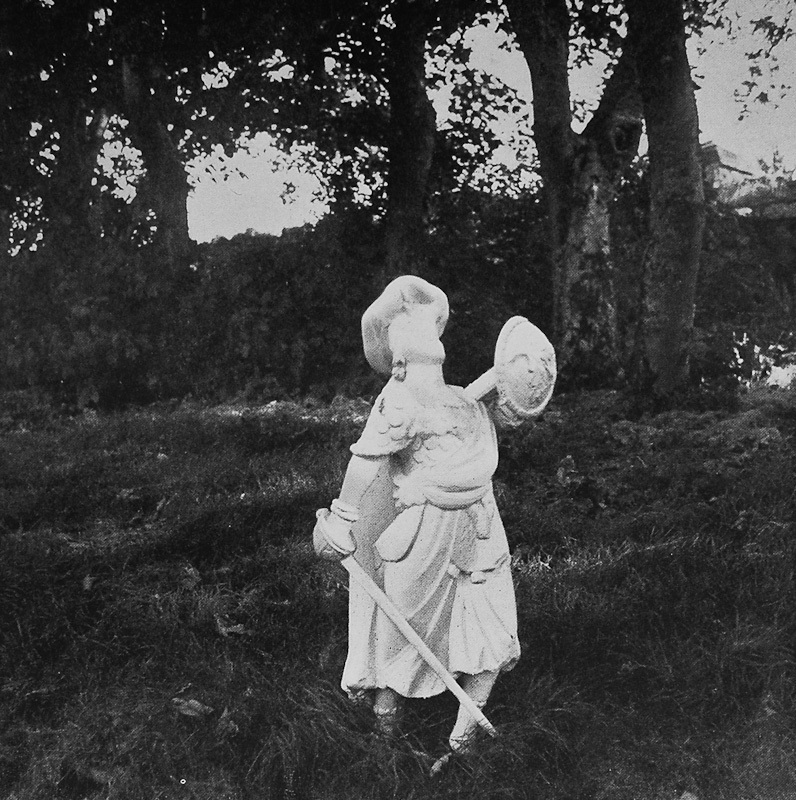 As I walked down the churchyard path I noticed on the north side only one monument, a grotesque statue of a bellicose Amazon in Scottish dress and holding a pose of ludicrous defiance. It is the figurehead of the brig, Caledonia, flung on the rocks and pounded to pieces by an equinoctial gale in 1843, one of the eighty wrecks on this coast that occurred in the lifetime of one of Hawker’s parishioners. In Footprints of Former men in Far Cornwall Hawker has given an account of this wreck from which there was only one survivor, a Jersey boy who was to supply him with the nucleus of his herd of Jersey cows. 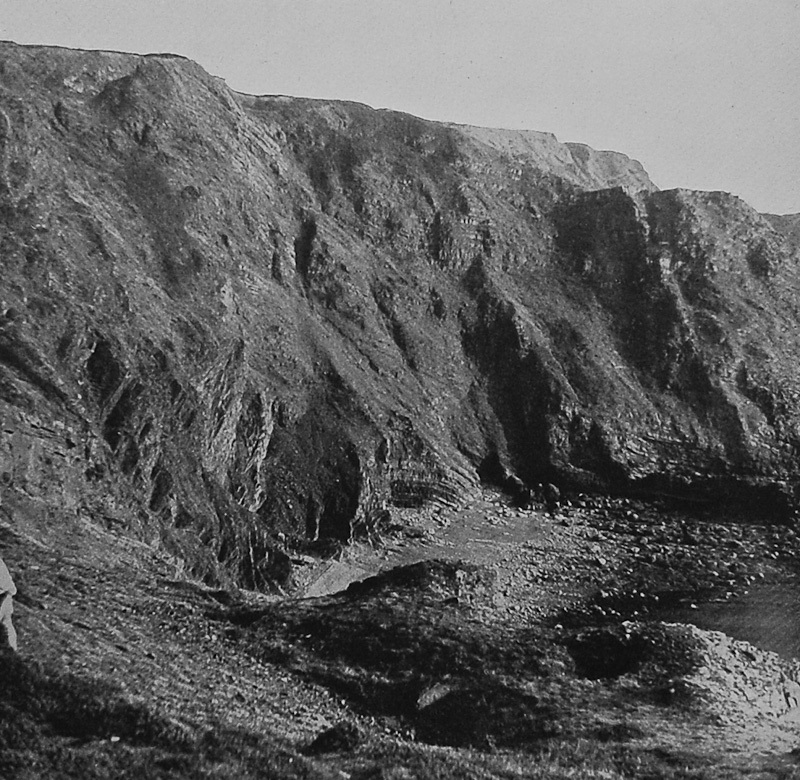 It was due to Hawker that not only were smuggling and wrecking ended in Morwenstowe parish but the dead from the numerous shipwrecks on this ferocious part of the coast buried in the churchyard by himself heading procession after procession of corpse-bearers up the steep path from the cliffs. 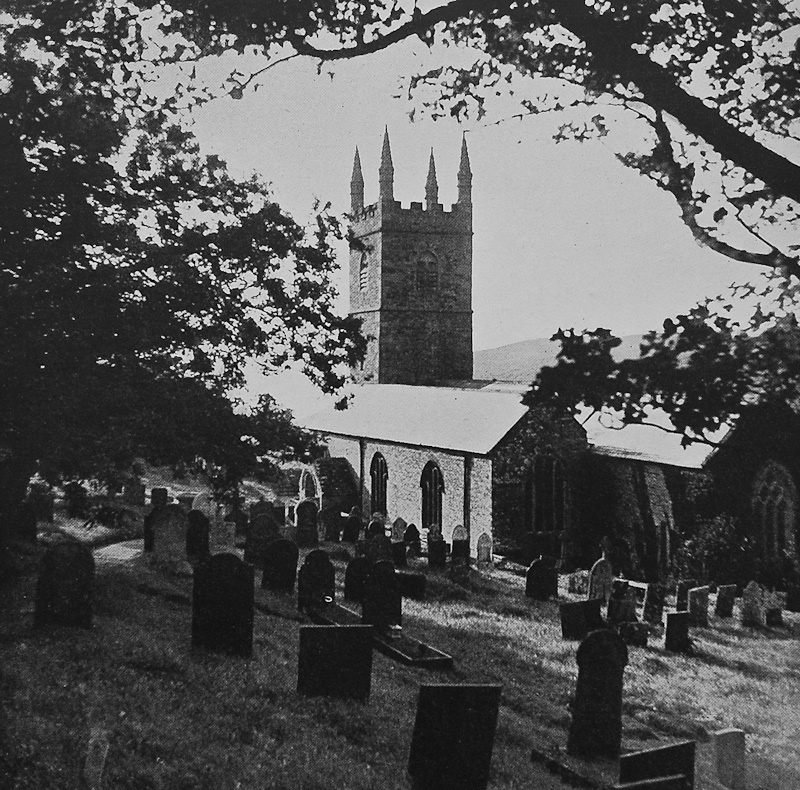 One may guess something of what the weather may be like at Morwenstowe from the fact that Baring-Gould, one of Hawker’s biographers, could reach the church one Sunday of gale to take service for the Vicar only by clinging to the tombstones. 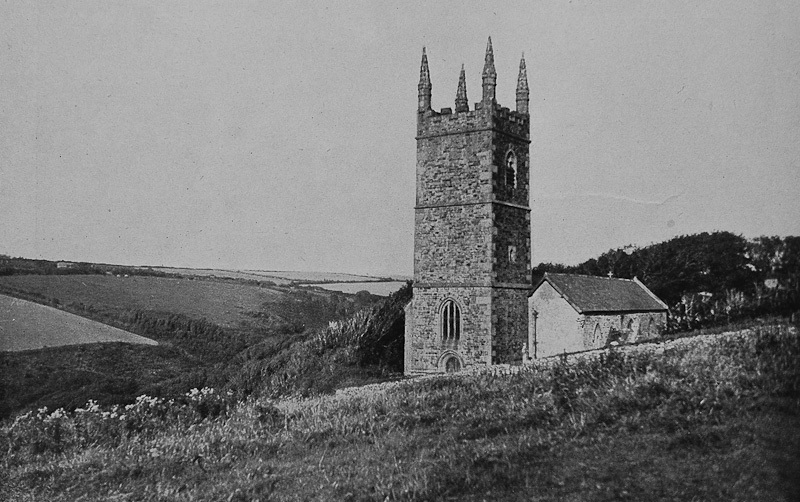 The church itself is one of the few in Cornwall with Norman foundations and the structure in past still stands. Thanks to him, the carved oak benches are still intact and the whole church is filled with rich and primitive ornament that illustrates another aspect of him, his passion for symbolism. He delighted to conduct visitors round and into his church explaining its Biblical mythology and Gothic iconography and what most exhilarated him was the wagon-roof boss of the five-angled pentacle of Solomon, the mighty seal by which Solomon ruled the demons and figuring “the fingers of Omnipotence as the Symbolic hand came forth in shadows on Belshazzar’s wall.” In an indescribable sense, this church, itself a hotchpotch of the ages and almost as superabundant in carved images as his head was crowded with mystical significations, belongs to Hawker who impoverished himself to preserve and restore it. On his deathbed when he was in physical and nervous prostration, Hawker became a convert to the Roman Catholic Church, much to the scandal of Victorian opinion. But nobody can read his poems (none of them very good) nor follow his life as written by his son-in-law (which had real saintliness, in spite of a certain truculence and self-will) without perceiving where his true and passionate allegiance lay — in the Celtic Church of St. Morwenna, which was neither Catholic nor Anglican. One of the most significant points about Hawker’s life is his combination in it of the mystic with the man of action. He was a great builder, partly restoring the church with his own hands and constructing not only the bartons and outbuildings of his farm but a church-school and the Vicarage, situated a little higher up the glen above the church and with its chimneys imitating the towers of the churches he had served before coming to Morwenstowe in 1834. Out of the timbers from the wrecks of the ships from which he saved many lives he built a hut on the edge of the cliffs where he wrote his poems and meditated hour after hour. For his parish he was an indefatigable worker and of boundless charity towards the poor, the sick and the shipwrecked. He made a tremendous success of his two marriages, one to a wife 20 years older than himself and the other to one 40 years younger. He was virtually the master of his inhospitable and outlandish parish, the magnetic centre of the church and the people, the land and the sea. In a sense he was Morwenstowe: he identified himself with it so completely, he threw himself so ardently into its regeneration that place and person were interlocked. What was perhaps the most remarkable fact about him is one mentioned perfunctorily or not at all by his two biographers. He was a highly successful farmer, not in making money but in growing things, and any visitor to Morwenstowe will see at a glance what an achievement this was on a gale-exposed land that looks nowadays only fit for very rough grazing. He carried his glebe right up to the cliff edge, grew wheat, barley and clover on it, kept Jerseys pigs, poultry, horses and ducks and produced the best crops in the parish. He paid his men well and encouraged the old fertility festivals like “Crying the Neck”. He conducted his farm-work in, to quote his son-in-law, “a spirit of patriarchal piety” and to him husbandry was almost as sacramental an office as were his church services. He was in fact an integrated man and all his activities were bound up together — mysticism, preaching, farming, writing, building and partaking in the life of the parish. It is impossible to consider him apart from Morwenstowe and of no man could it be more truly said that he was adscriptus glebae. This article by H. J. Massingham appeared in the magazine Out of Doors, Vol. 13, No, 10, January 1952, illustrated with photos by George W. F. Ellis. Used by permission of The Society of Authors as the Literary Representative of the Estate of H. J. Massingham.